The problem, I think, was that not one of these strong, active heroines had a goal. They had expertise, they were parachuted into action-packed scenes, and they responded as they had been trained to do. They saved themselves, children, cute puppies and even hunky heroes. Things happened to them, and they reacted. Boom! Pow! It was too bad that I didn’t know who these women were, or what they wanted, or why they were doing what they were doing. I admired their heroism, but I didn’t know what their story was about. As I didn’t want to know whether they’d find their missing sibling, or figure out who stole their inheritance, or track down the blackmailer, I didn’t much care about them or invest in their adventures. It’s at times like these that I realise how much I’ve learned over the last few years. I tend to assume that every aspiring romance writer will have read, or at least have heard of, Debra Dixon’s G.M.C. Her book is a simple, clear explanation of the idea that for a story to have shape and urgency, it helps if the main character has a strong Goal and the Motivation to pursue it in the face of Conflict. If the character has an objective they’ll pursue to the death (physical or psychic), then the reader has a reason to stick around—to find out what happens. If said character has a powerful reason for pursuing their goal, their Motivation should, could make the reader care whether the character gets their goal. And if there’s a Conflict—another character with an opposing goal and equally strong motivation—then you have the kind of juicy, energetic push-and-pull that keeps readers awake and turning the pages long after bedtime. It made me melancholy to read such clean prose and potentially interesting characters with so little basic story DNA. So what did you read this week? How was it for you? This entry was posted in Basic writing skills, Character, Goals, Story Telling, Strong female protagonists and tagged #amwriting, #amwritingromance, Debra Dixon's GMC, eight ladies writing, Jilly Wood, judging writing contests, writing tips. Bookmark the permalink. ← Michaeline: Review of the new Bujold “Knife Children”! If I am the heroine of my own story . . . I’m overflowing with character, but lacking motivation and a goal right now. And it’s always been a problem! Write what you know? Hah. I pretend I know what that stuff means, but honestly? To take an example: I want to learn the ukulele. So, I do it. Nobody tries to stop me, although I will say few people want to listen to me. But having an audience isn’t quite my goal, and I don’t have the motivation to accomplish “Get audience”. Not yet. It sounds like some of the characters you mention have great goals. Find sibling. Revenge on thief or blackmailer. Maybe it’s a problem with the villain? Not enough people causing drama and thwarting the heroine? Oh, I’m glad you clarified, Jilly! Like Michaeline, I was thinking that finding a missing sister, taking down a blackmailer, etc., while maybe not my cuppa (or maybe, depending on context! ), sounded like pretty active goals. Foxes! Well, we will have to see! I’ve also been reading contest entries and my enjoyment of them has paralleled the degree to which the protagonist had a clear goal that she pursued single-mindedly throughout the narrative. In the demon book I’m working on now, my protagonist has such a goal: she’s trying to get out of a contract she signed with Satan before her soul comes due for collection. (We don’t even need any backstory to understand her motivation. Understanding why she signed such a contract in the first place, however, needs a bit of explanation.) And she has an antagonist, the she-demon Lilith who is once again trying to prove to her boss that she can out-gun all the demons in the old boys club that prevails in Hell (as well as corporate America). Where I’m falling down, I think, is that none of my minor characters have similar goals and motivations. Must cogitate. Yikes, that’s a compelling goal. Backstory a bonus. I’d definitely stick around to find out why Your Girl signed that contract, and how she’s ever going to get out of it. I assume Hell has quite a bit of experience in making sure people don’t get to change their mind when it comes time to pay up. To quote Jenny, “ARGH!” Every time I read a post like this, I question my character’s GMC. Like do they have any? I think Nate’s is tangible enough–prove Susannah’s uncle is guilty of treason (it shifts/changes slightly after he sees Susannah again, putting “keeping her safe” up there with “get her uncle”). And I think Susannah’s is okay–get her sister back from Jamaica. But in the daily grind of my character’s story day, I always wonder if I’m letting them down. *sigh* It’s no wonder we end up in a shriveling heap on the floor after a day of writing. It’s Nate’s book, right? And he’s got a solid goal. Catch the treasonous uncle, and for personal reasons, not just abstract ones. I think you’re good. Nate has that goal to the end of the book, right, even though after he meets S again his reasons for needing to get the uncle become even stronger and even more personal. That’s powerful. Plenty for a reader to invest in. And S has a strong goal of her own, and a powerful motivation for pursuing it. The GMC thing is something I’m thinking about as I start my new project. It’s the third book featuring the same characters, so it’s a bit of a stretch to call it a “series,” so maybe a mini-series. I thought I was all set with plot, since I ripped one from the headlines. But it turns out that GMC isn’t so simple when your peeps have established characters and traits. You don’t want to write book after book with the same GMC for these folks. One of my critique partners wants the book to begin with my heroine hating the hero because he ruined her life…in book one. My heroine still isn’t comfortable with him, but they’ve reached a tentative détente. And my hero works for the FBI, so yeah, he’s out for the bad guys, but it’s hard to make the central crime of the story the G and M every time. It’s almost like you need a secondary G and M when their occupations and personalities don’t change—can’t change, if you want readers to love your characters long term. Anyway, yes. GMC, that’s the ticket! And, sorry about those contest entries. Yeah, I’m sorry for the contest entries too. If they’d been bad, I wouldn’t have cared, but they weren’t. You’re so right that GMC becomes harder over multiple books, and I hate it when characters have false break-ups and make-ups just to keep the series alive. It must be possible to develop the same main characters, given that Nora has written I don’t know how many Eve and Roarke books now 😉 . I guess the characters do have to grow and change, while keeping the traits you gave them in the beginning (better hope you gave them some scope for development). Sounds as though your heroine would definitely respond in some important way to having her life ruined in Book One–it doesn’t have to be to hate the hero though. It could be to make amends for something she did, or to make the most of her second chance, or to make some other huge change (that might or might not stick). Another thought, wandering a little away from GMC for a moment, might be to plunder Michael Hague’s idea of Identity to Essence. Identity being the face we present to the world, or even who we’d like to think we are. Essence being who we really are deep down, behind the mask. The characters get happier as they change their identity to more closely match their essence. And often the best romances are characters whose identities are wildly divergent but who are essentially a match. Just riffin’. Anyway, good luck with your heroine’s GMC. You’ll figure it out! I’ve got to go with Bujold and Miles Vorkosigan again. Miles hits all these milestones and does keep growing as a human being. It’s funny; we think we’re all grown up (at least I did at 22), and then we discover we have more growing to do! I wasn’t ready to be married at 22, and I was definitely not ready for children at 22 (some are; some are forced to be). I wouldn’t have been ready to care for a parent at that age. We all have our challenges that force us to grow, and I think it’s important for characters in a long-term series to reflect that. First job, first change of jobs, first long-term romance, first break up . . . .
Now that I think of it, Amelia Peabody is a great case study (Elizabeth Peters). She is also a know-it-all from the beginning, but then must learn to soften and bend in order to enjoy her life. The Eve and Roarke books—what a good idea. I don’t have time to read them all if I ever want to finish this book, but I could probably read a couple and see what she does with them over time. Nora really is a wonder woman. And I have a ton of Michael Hauge’s emails sitting in my queue right now, so I’ll check out his latest thoughts, too. Your post got me to thinking, however, about books by some bestselling authors that I’ve read that I feel had the same problem, like the latest Julia Quinn book that I read – lovely writing as always, but I never felt like I was reading about a “girl with a goal”. The heroine winds up stuck aboard ship with the hero and his crew, after she stumbles upon a cave full of cargo. She doesn’t have to do anything. She’s not in mortal danger. All she has to do is bide her time until the ship reaches port and all will be well. The characters had fun interactions and, of course, fell in love along the way, but . . . ? 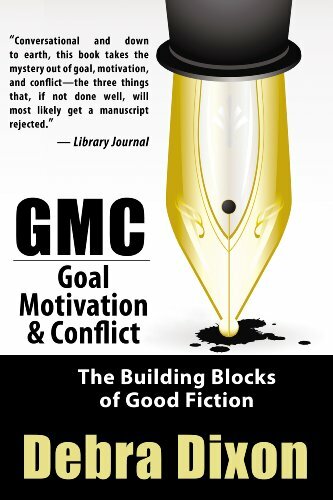 The book was a best-seller, so perhaps here is a whole group of readers out there that will happily read a GMC-less story, if they are presented with characters they like. Or maybe I just overlooked the whole GMC of the story. Always possible.